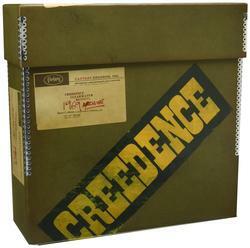 (3-LP + 3-CD +3-7" + Book) Straight from the fantasy vaults comes the 1969 Archive Box, documenting an unparalleled year of creative achievement by one of the world s most enduring rock bands Creedence Clearwater Revival. In this year alone, the band would release three incredible albums, have four hit US singles, perform on the Ed Sullivan show twice, tour the US and headline Saturday night of the Woodstock Festival. John Fogerty, Tom Fogerty, Doug Clifford and Stu Cook would not only push their bayou-steeped music to great success in the US, but also across the globe. Drawing exclusively from archival material, this 1969 time capsule is intended to capture that year in real time, with interviews, reviews, charts and correspondences in addition to LPs and singles from around the world. Great efforts have been made to keep all contents as close to original reproductions as possible, including misspellings, flipped A and B sides, colored vinyl and much, much more.